High-speed switching of integrated circuits requires special design features used in the high-power IC transmitter and three-wire IC servo presented this month. 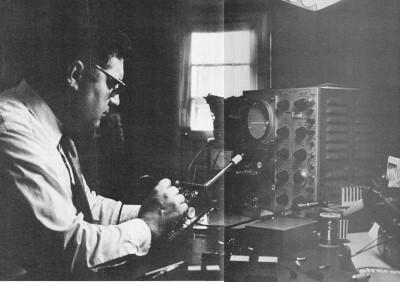 In the preceding issue, we described the entire system, presented the printed circuit layout and the parts list, with in-formation useful in procuring parts, and illustrated some preliminary assemblies to be made in advance for building the transmitter. 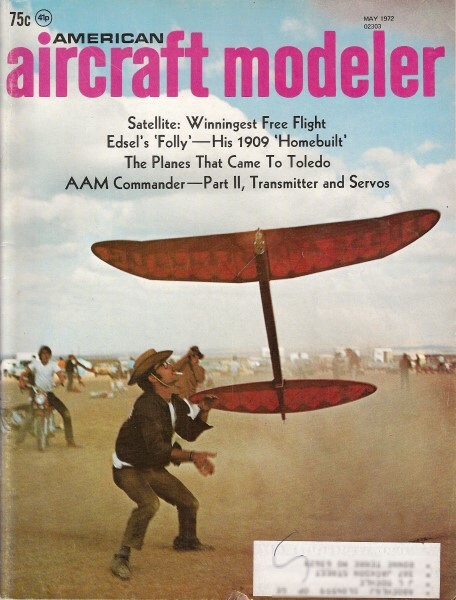 This issue will contain instructions for transmitter and servo assembly plus the design information for them. Since it may be confusing to pull the design information for individual units from context, we shall review the operation of digital systems. Overall functioning of the system is shown in a simplified form by the block diagram and approximate waveforms in Figure 1. More detailed block diagrams and schematics for the sub-functions will be presented in the discussion of individual units. The frame time (T1) is set by the master clock, in this case a relaxation oscillator, at about 14 milliseconds. The inverse, or frame rate, is 1000 divided by 14 or about 70 frames per second. In other words, the servos will receive new command information 70 times each second. 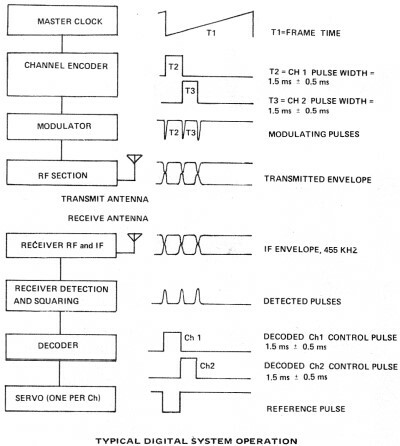 The sharp fall at the end of the sawtooth ramp is differentiated to produce a synchronization pulse that is transmitted, but also starts the channel encoder to work by initiating the pulse, identified by time period T2. T2 is variable by the Channel 1 control pot from a nominal 1.5 ms to as short as 1.0 ms or as long as 2.0 ms. The sharp fall of the trailing edge of the Channel pulse is also differentiated and transmitted but simultaneously initiates the Channel 2 control pulse. The Channel 2 pulse length is variable just as the Channel 1 pulse. The trailing edge of the Channel 2 pulse is also differentiated to form a spike and is transmitted. The actual transmitted envelope is a continuous wave at the desired R F frequency with three short modulation pulses separated by T1 and T2. The receiver accepts the R F envelope and detects, or reconstructs, the original modulating pulses. The decoder acts upon these three pulses to reconstruct the original control pulses (T1 and T2) and route them to the servos for the respective channels. The servo accepts the decoded pulse of duration T1 routed to it and compares the length of that pulse to a reference pulse whose length is set by a feedback potentiometer in the servo. At neutral the length of the reference pulse is 1.5 ms. The objective is for duration of the servo reference pulse to exactly match the duration of the control pulse. When they differ, the servo output moves in the appropriate direction to nullify the error. Since new information is being received by the servo 70 times per second, motion is smooth and precise, which was the objective of the whole process. 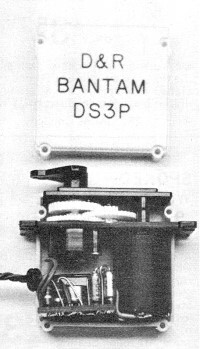 The transmitter, receiver, and decoder can be simulated by a simple servo tester as far as the servo is concerned. The transmitter was designed for ease of building and adjustment. Output power is relatively high-approximately one watt into the final stage when operated at 9.6 volts. The oscillator is stable and broad with primary frequency control provided by the crystal. Refer to Figure 2a, the block diagram, and Figure 2b, the schematic, for the following discussion. 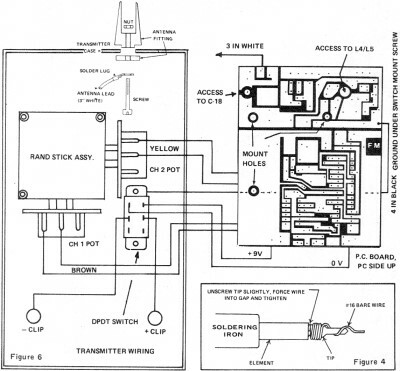 The transmitter is designed exactly like the block diagram and will be discussed in the order from bottom to top. The schematic is laid out exactly the same, and (surprise!) so is the transmitter P.C. board. The master clock is oblivious to anything else going on in the transmitter - it simply generates a 6V amplitude sawtooth every 14 milliseconds. This master clock consists of Q1, C1, R1, R2 and R3. The repetition rate may be changed by varying the value of R3. The falling edge of the sawtooth is differentiated by R4 and C2 to form the synchronization pulse (a 1.5V amplitude spike), which is the first in the series of the three required for a two-channel system. This pulse also serves as the clock pulse for the first control pulse generator which is a monostable or one shot, multivibrator M1, formed of the gates of IC1 (see schematic). It also connects to the input of Expander E1. The first one shot is used for Channel 1 in this system and is formed of G1, G2, C3, and the rudder control pot. When G1 is "clocked" by the synchronization pulse, it flips to the "on" condition at its output until C3 completes its discharge through G1, G2, and the control pot. The position of the control pot determines the length of time that M1 remains "on"-nominally 1.5 milliseconds and ± 0.5 milliseconds. The trailing edge of this 3.6V square Wiring in the ACE case with the Rand stick assembly is short and direct. P.C. board has been moved aside for clarity. pulse is differentiated by R5 and C4. This differentiated pulse (a spike 1.5V in amplitude) "clocks" the second one shot multi (M2) and also is fed to the second input of Expander E1. The second control pulse generator for Channel 2 is formed by G5 and G6 located in IC2. It functions precisely the same as M1, except that it is controlled by the Ch. 2 control pot. The trailing edge of the 1.5 ms square pulse for Ch. 2 is differentiated by R6 and C8 and is fed to one input of Expander E2. The three spikes generated as just described (i.e., the differentiated output of the master clock pulse, first control pulse generator, and second control pulse generator) are fed to the quad expander (IC3). The expander functions in the same manner as a gate but introduces some gain, is capable of handling greater output loading, and widens the spikes slightly by some integration performed by R7 and C7. The output of the expander is the train of three pulses with amplitude of 3.5 volts and a width of nominally 250 microseconds. The chore of modulation is too much for inexpensive ICs, so the output from the pulse expander is amplified and shaped by the modulator formed by CB, Q2, R11, R1O and R12. The ICs require 3.B volts; rather than using a tapped battery supply, a regulator is used to derive 3.B volts from the 9V transmitter supply. This is a simple device consisting of ZI (a reference Zener diode) which senses output and controls the bias on Q4 which has a high impedance. Thus little current is wasted. L1, L2 and L3 simply isolate the RF section from the encoder/modulator. The R F oscillator consists of Q5, the crystal, C11, R15, R17, C12, C13 and L4. The inductive/capacitive (LC) circuit L4/C13 and the crystal set the frequency. The resistive/capacitive (RC) circuits shown (R17/C12 and RI5/C11) reduce the possibility of undesired harmonics. The output is a sine wave at the desired frequency approximately 0.2 volts in amplitude. The output of the oscillator is coupled to L5 and is amplified by the output transistor, Q6. Modulation is introduced via the 47 mF capacitor (C10) coupling to the modulator Q3 via L2. This capacitor, in effect, shows the base of Q6 a direct short to ground each time a pulse is received from the encoder/ modulator, however the rise and fall of the modulating pulse is carefully shaped by C10, C14, R18 and the modulator to avoid unwanted harmonics. The RF amplifier takes the input from the oscillator and increases the amplitude. Since transistors can also amplify unwanted harmonics, a final trap formed by inductor L7 and C 17 is used to tune the output stage and match the impedance of the output transistors. The output is coupled capacitively to the antenna by C19. There are a few points of interest regarding the output section. The output transistors are paralleled for somewhat greater output but at the expense of current drain. The use of the heat sink provides a margin for the transistor and we have operated the transmitter on from 9 to 12 volts. Operation becomes unsatisfactory when battery voltage goes below about 7.5. No metering circuit is provided for the sake of simplicity. If the planned use for the system is a boat or car installation, Q7 and R20 may be deleted to reduce output and, thus, current drain. However, the use of the heat sink on Q6 then becomes a necessity. The servo is based on application of the World Engines integrated circuit, manufactured for them by Signetics, Inc. 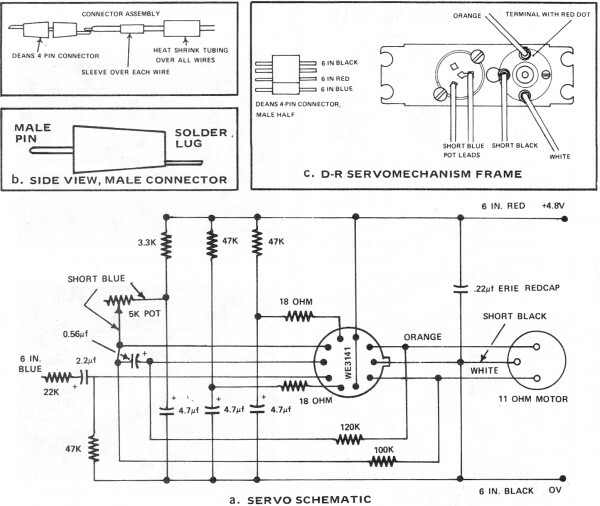 Figure 3a presents the schematic for the servo amplifier. 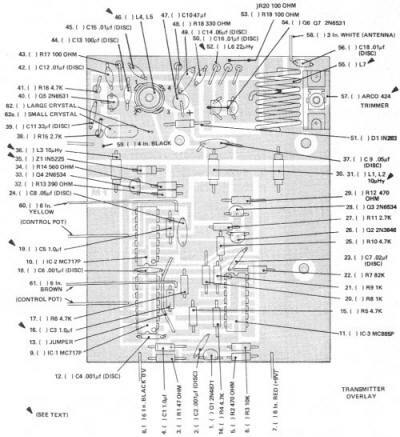 Our overall amplifier design is essentially the same as that used by World Engines. One resistor was Changed to obtain the proper damping margin with the rather quick, small D-R servos. A new, tighter P.C. layout was used to permit installation in the smallest servos . 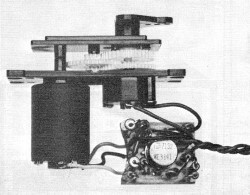 The use of the World Engines IC introduced some unique problems, not in the design of the servo but of the receiver. Filtering of receiver power supply must be good because the IC amplifier switches so rapidly that electrical spikes are generated in the power supply. I have seen two other servo amp designs which use the same chip and each has several changes, presumably in an attempt to overcome the electrical spiking. We felt constrained to use enough filtering in the receiver to permit the use of alkaline energizers, which are more susceptible to electrical spiking because of their slightly higher internal resistance (compared to nickel-cadmium cells). The problem is not severe enough to require use of an active filter but any tighter servo performance certainly will. The servo amplifier is a bridge circuit-a two-wire battery pack can be used. It is the equivalent to a discrete component bridge amplifier requiring 14 transistors and 34 discrete components. It actually has 31 transistors on the chip. Basically the amplifier performs the same function as any other, but most of the action is internal to the chip. The design has one nicety that further helps reduce failure-only two wires are required to the feedback pot meaning one less wire to break. No arc suppression components need be mounted on the motor, making it a clean installation. The servo will operate satisfactorily from 3.6 volts. However, it will not tolerate the added drop of a diode so that the use of a bypass diode on a failed battery will not guard against battery failure. This servo does offer the potential for use with a 3.6V system with slightly reduced power and speed. Resolution of the amplifier with both D-R servomechanisms is outstanding. Average thrust is about 2.75 lb. at a radius of 0.3 in. for an output torque of 0.92 in.-lb. Transit time is approximately 0.6 sec. Resolution was measured to be 0.25 degrees. The servo is quite capable of measuring stick slop. Angular throw with the transmitter is ± 40 degrees and trim is ± 8 degrees. Stability, resolution, and transit time at 0°F and 150°F were found to be unchanged. Check the components obtained against the components list in the April issue. Study the overlay drawing (Figure 5), then drill the hole beneath the enter of the ARCO 424 trimmer and beneath the center of L4/L5 to 3/16-in. diameter. Drill the three unoccupied holes marked by the bulls eyes to 1/8 in. to accept mounting screws. Drill three holes for L7, two for C17, four for L3/L4, and (if a large crystal is used) for the crystal pins; to 5/64 inch diameter. Clean the P.C. board thoroughly with steel wool. Proceed to assemble all components on the pc board as shown on the overlay drawings (Figure 5). Follow the numbered sequence as shown. 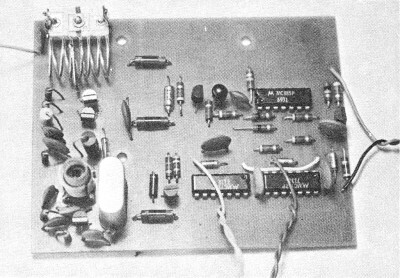 The basing arrangement for the transistors used was presented in the last issue. Observe the identification of the IC's installed in steps 9, 10 and 11. It would be embarrassing to have to desolder 14 pins if put in incorrectly. The 10 mH RF chokes L1, L2 and L3 installed in steps 30, 31 and 36 look like resistors with wire windings on them. They require careful bending to fit in the holes. Observe the polarity of the tantalum capacitors. Those made by Components Inc. have the + end identified by a red cap. Sprague capacitors have a + stamped on them. Do not confuse the identification of tolerance, i.e., ± 20%, as the polarity identification. At step 35 where Z1 is installed, be sure to place the banded end as shown on the overlay. Note that the crystal is installed at nearly the last step to protect it. Provisions are made for either a small or a large crystal. At step 46, L4 and L5 which were constructed earlier are installed on the P.C. board. Looking at the overlay, terminals 1 and 2 are to the left, 3 and 4 to the right (i.e., the hook-up wire secondary goes to the right). RF chokes L1, L2 and L3 installed in steps 30, 31 and 36 look like resistors with wire windings on them. They require careful bending to fit in the holes. Observe the polarity of the tantalum capacitors. Those made by Components Inc. have the + end identified by a red cap. Sprague capacitors have a + stamped on them. Do not confuse the identification of tolerance, i.e., ± 20%, as the polarity identification. At step 35 where Z1 is installed, be sure to place the banded end as shown on the overlay. Note that the crystal is installed at nearly the last step to protect it. Provisions are made for either a small or a large crystal. At step 46, L4 and L5 which were constructed earlier are installed on the P.C. board. Looking at the overlay, terminals 1 and 2 are to the left, 3 and 4 to the right (i.e., the hook-up wire secondary goes to the right). At step 47, C10, a 47 uF tantalum is installed. The positive polarity end as shown on the overlay is up-pointing back toward the encoder. At step 51, be sure the banded end of the diode is placed as shown. At step 52, L6, a 22tantalum is installed. The positive polarity end as shown on the overlay is up-pointing back toward the encoder. At step 51, be sure the banded end of the diode is placed as shown. At step 52, L6, a 22 mH choke is installed. This is a molded choke and looks quite similar to a resistor but may be identified by the color code: silver, red, red, grey, silver. At steps 54 and 55 install the output transistors Q6 and Q7. The type shown is the Motorola 2N6531, however the GE 2N70BA may be substituted in both the Q5, and Q6/Q7 locations. In step 57 position the adjustment screw of C17 so that it reaches through the 3/16-in. hole in the P.C. board. When P.C. board assembly is completed, remove all solder resin with thinner and an old toothbrush. Check the P.C. side of the board against Figure 6 to make certain there are no solder bridges. The eight wires to be connected are shown in Figure 6. Connecting the pots as shown (i.e., brown wires to rudder pot) gives rudder on Channel 1 and elevator (yellow wires) on Channel 2. Travel may be reversed by using the other end terminal of the pot. After the wires are connected, check the resistance between the 9V and 0 buss using a good quality ohmmeter. The resistance should be about 150 ohms. If less, recheck for shorts or components improperly installed. Cut three 9/16-in. lengths of the outside section of Nyrod or fuel tubing for use as standoffs. Mount the Rand stick assembly in the ACE case then mount the antenna fitting and the switch. Mount the transmitter P.C. board to the Rand stick using the three lengths of . tubing and 7/8-in. 4-40 screws. Check to see that the screw heads do not touch the P.C. lands. If you use any other stick assembly, you must provide an alternate method of P.C. board attachment. Connect the ground lead of a voltmeter to 0 volts. Check the supply voltage for 9V or more. Check the regulated voltage at the emitter of Q4 - it should read close to 3.8 volts. Connect the ground lead of an oscilloscope to 0 volts. Connect the probe to the junction of capacitor C4 (see overlay) and pin 14 of IC1 with the stick and trim cent control pot so pulse is exactly 1.5 ms. Lock the control pot screw. Full stick movement should change the pulse width by approximately ±0.5 ms. This sets rudder pulse width. Repeat step 31 but with the probe placed at the junction of capacitor C6 and pin 14 of IC2. This sets the elevator pulse width. (a) If a scope with sensitivity of 0.01 volts/cm or less and a frequency range covering 27 MHz is available, simply loop the probe lead twice around the extended antenna. Adjust the slug in L4/L5 until a signal is seen and check to be sure the oscillator recovers when the crystal is shorted by your thumb. Adjust the Arco 424 trimmer (C17) so that the amplitude of the displayed signal peaks. (b) If a field strength meter is available, hold the transmitter antenna nearby and adjust the slug in L4/L5 until a reading is observed. Perform the same check of oscillator stability as above. Adjust C17 for peak FSM meter reading. (c) If a VTVM is available, construct a demodulator as shown in Figure 2c and use it and the VTVM as an FSM as in (b) above. Check the fit of the P.C. board in the servo case. When installing IC1, clip each of the leads about 1/16 in. shorter than the preceding lead, proceeding from one through eight. The shortest lead must be at least 1/4 in. long. Leave the lead located at the tab full length. This permits easier positioning and insertion of the leads. Install the components in the order shown in Figure 7. Caution: Do not forget the 1/8 watt, 120k resistor which goes on the bottom of the board. Figure 10 is provided to show exactly where it goes. Cut the hook-up wires to length, strip 1/8 in., tin, and solder in place on the board. 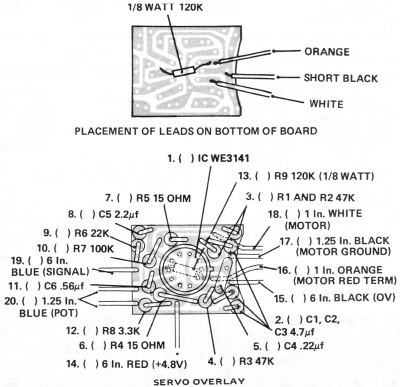 Note that the wires going to the motor are soldered to the bottom of the board (Figure 7) not through holes drilled in the board. Use dope thinner or alcohol and scrub all the resin from the P.C. board. Prepare the feedback potentiometer element as shown in Figure 11. Twist the six-in. blue, red and black leads tightly and clip to the same length. Slip a rubber grommet over the wires. Slip a 1/2 inch piece of 1/8 10 heat shrink tubing over these three wires. Slip one of the pieces of sleeving provided with the Deans four pin connectors over each wire. Strip 1/8 in. of the ends of the three wires and tin. Tin three of the pins of the male half of the Deans four pin connector (Figure 3b) and solder the wires to their respective pins as shown in Figure 3b. Slip the sleeving up over the pins and wires then re-twist them. Heat this tubing with a soldering iron to shrink evenly, or use a lighted match. Complete the wiring of the pot and motor as follows: Strip 1/8 in. from the ends of the short blue, white, black and orange wires and tin. Prepare the potentiometer element by clipping the lugs to one of the pot terminals and motor terminals as shown in Figure 3c. The D-R Servomechanism is intended as a replacement mechanism for a number of systems. Therefore, the small disc which holds the pot wiper is not assembled. Mount the pot wiper as shown in the D-R instructions and place the assembly on the wiper shaft with the dual contacts which wipe the pot element centered toward the motor end of the mechanism and with the output arm centered. This can be checked by observing that the small stop pin on the output gear is exactly in the center of the servo. Now, mount the potentiometer element using the small screws provided with the mechanism; position the pot element as shown in Figure 3c. This should automatically place the pot wiper near the center of the element. This may be checked with an ohmmeter; the resistances should be equalized between the center and end below in white. too terminals of the pot. The servo amplifier is sufficiently consistent that this gives a 1.5 ms servo reference pulse and may be used for setting up the system. One then simply sets the transmitter control pots so that the servos center. Do not place the motor in position yet. Plug in the servo and turn on the transmitter and receiver. If interfacing with a transmitter which has had pulse width set to 1.5 ms, slowly rotate the servo output until the motor halts, reverses direction, or pulses back and forth slightly. If the output is not centered at this point, loosen the pot retention screws and rotate the element slightly until the output is centered. Retighten the screws and place the motor in position. The output should be centered and travel should be smooth with a swing of about ±45 degrees. Place a 1/2 in. length of servo mount tape over the pot element to prevent shorts to the solder lugs. Place a small square of foam padding against the servo amplifier bottom and assemble the servomechanism as shown in its instructions. The servomechanism illustrated is manufactured by D-R. The amplifier has been installed and tested in the Orbit PS-4, Kraft KPS-12, and Controlaire S-4 servomechanisms. The amplifier will undoubtedly work with almost any servo-mechanism made today. However, it is relatively critical of decoder and receiver design since it is designed to operate best with clean switching TTL integrated circuit decoders. * These assembly instructions have been edited heavily to permit their presentation in the limited space available. Full instructions, in check-off format, are available from ACE RIC upon request. The instructions provided here are adequate to complete the assembly of the system, but must be followed carefully. +The Editor.